*The creditors holding the debt for NEW JERSEY's Nassau Broadcasting Partners are moving quickly on their attempt to force the company into Chapter 7 bankruptcy and liquidation: they've persuaded Judge Kevin Goss of the U.S. Bankruptcy Court in Delaware to move up a hearing on the petition to this Thursday morning at 10, claiming "there is a genuine concern that assets of the alleged debtor's estates may be used for purposes other than those directly related to the normal course operations of the alleged debtor's businesses." The petition from the lenders, led by Goldman Sachs, says they're worried that Nassau money may be used "to further the personal and parochial interests of" Lou Mercatanti, who's run the company since 1986. *There's a TV station sale in PENNSYLVANIA: WTVE (Channel 51) is licensed to Reading but serves most of the Philadelphia market through the use of a "distributed transmission system" that employs multiple RF channel 25 transmitters scattered across the region. Richard French, who owns WRNN in the New York market, paid $13.5 million for the station at a bankruptcy sale in 2008. He'll get $30.4 million from NRJ TV for the signal, and it's not at all clear yet what NRJ plans to do with WTVE. NRJ recently bought two former Shop at Home stations, Boston-market WMFP and San Francisco's KCNS, and thus far it has made no change to those stations' programming. That's fueled speculation that NRJ is less interested in running TV stations than in reaping the value of the UHF spectrum on which those stations operate; in an interview with TVNewsCheck.com, NRJ principal Ted Bartley (sort of) denied those rumors, saying "Were trying to buy at a price to operate them efficiently and make money as broadcasters," but also saying of the possible auction of TV spectrum to wireless operators, "We are certainly not speculating on that as the only way to make money." *On the other side of the state, there's a programming change at Pittsburgh's WINP (Channel 16): the ShopNBC programming that had been running on 16.1 is gone, replaced by the main-channel programming from new owner ion Media. When ion bought the station (formerly WQEX) from public broadcaster WQED, it inherited the ShopNBC contract, but now that it's over, WINP is taking on the usual set of ion multiplex channels seen elsewhere in the country: ion's main channel on 16.1, with Qubo and ion Life on 16.2 and 16.3. *In Philadelphia, there's a new owner at WHAT (1340), which recently returned to the air with a Spanish-language hits format as "El Zol 1340, el ritmo de Philly." Aztec Capital Partners has been programming that format, and now it's buying the station from former owner Marconi Broadcasting Company. Marconi paid $5 million for the 1000-watt signal five years ago, but Aztec's paying only a fraction of that: just $475,000. *Pittsburgh's new public broadcaster continues to staff up its management team, and it's made a big new hire from out of town. Deanne Hamilton comes to Essential Public Radio's WESA (90.5) as general manager after a career that's included stops at KQED in San Francisco and most recently at WKAR public radio/TV at Michigan State University in East Lansing, where she departed in July just ahead of some unflattering news stories about serious financial problems and what appears to be a rather serious lack of transparency at the stations. Hamilton starts her new job at WESA on October 17th, and her first big challenge will be getting the station's studios moved out of the old WDUQ temporary space on the campus of former owner Duquesne University and into its new home shared with sister station WYEP (91.3) on the South Side. *A radio veteran with much deeper Pittsburgh roots is off the air for now. Bev Smith has been hosting a daily talk show aimed at the African-American community since 1998, but that show will be history after October 28th. Syndicator American Urban Radio Networks says the cancellation of the "Bev Smith Show," heard on WGBN (1150 New Kensington) and 30 other stations around the country, is purely a matter of economics. Before moving to WGBN, Smith's show was a fixture on the old WAMO (860) prior to that station's sale. THE NEW FYBUSH.COM IS COMING SOON! It's been a month since we posted our "open letter" to NERW/fybush.com readers announcing some upcoming changes to the site. The response has been unbelievably gratifying: already, hundreds of you have signed up for subscriptions to the new version of fybush.com, and many of you have sent along very kind notes of thanks and support. And now it's almost time to flip the proverbial switch (or, perhaps, to hit the proverbial "plates on" button). Over the next couple of weeks, we'll be transitioning fybush.com and our sister sites, including tophour.com, to a new server and a new site design. If you've already subscribed, first, thank you! - and second, watch your e-mail sometime next week for the login and password that will give you access to all the good stuff you've come to expect from NERW and Tower Site of the Week, as well as some new, subscriber-exclusive content. Whether or not you've subscribed, please bookmark www.fybush.org. As we're going through the transition to the new server and new site, some content may be temporarily inaccessible at fybush.com, but we'll try to keep the .org version of the site up and running as long as possible until the new site is complete. Thanks for your patience. It's a big transition for us (our first redesign since...gulp...2001), and we appreciate your support as we work our way through it. *It's been a week of big radio changes in CANADA, starting with the demise of the last high-power CBC station on the AM dial between Newfoundland and Manitoba. With its new FM outlets, CBEW (97.5 Windsor) and CBEW-1 (91.9 Leamington), now on the air and some interference issues with cross-border signals resolved, the CBC shut down CBE (1550 Windsor) early on the morning of October 1, the sixty-first anniversary of CBE's sign-on in 1950. The sign-off itself happened without fanfare; indeed, the scheduled midnight end to CBE was stretched out for a bit as the station popped back on and off the air several times before finally dropping audio at 12:25, leaving just a dead carrier on 1550 instead of the "tune to FM" audio loop that has accompanied other CBC AM-to-FM moves in the past. Earlier in the day, CBE offered a little more acknowledgment of its move, including segments on CBC Windsor radio and TV newscasts about the station's history. There was also an open house Saturday at the CBC Windsor studios, part of a national set of CBC open houses to mark the network's 75th anniversary and Canada's Culture Days weekend. *While CBE's passing into history, a Toronto broadcaster is poised to make history with a new station launch today. Fitzroy Gordon's CKFG (98.7) will make its official debut later this morning, with an 11 AM news conference scheduled to announce the station's on-air identity. Gordon fought for years to establish a station owned by and serving Toronto's Afro-Caribbean community, operating his "CARN" on 98.7 for several successful test runs and overcoming objections from the CBC about potential interference to its CBLA (99.1) signal in order to win a license from the CRTC. And CKFG isn't the only new sound hitting the Toronto airwaves: down the dial at 88.1, there will soon be something new to replace the departed CKLN, which lost its license earlier this year amidst accusations of loss of management control. Evanov's "103.9 Proud FM" (CIRR) has asked the CRTC for permission to move the gay-oriented station down the dial to the now-vacant 88.1 slot and to boost its power in the process. Rather than simply ruling on CIRR's application, though, the CRTC is opening the process up to competing applications. It's set a December 19 deadline for other interested parties to submit their own applications for new 88.1 signals, though it warns that "the Commission has not reached any conclusion on the licensing of any service at this time." By the time the CRTC gets around to reviewing those applications, it will have a new leader, too: while chairman Konrad von Finckenstein had hoped to be reappointed to a second five-year term, it was not to be: Heritage Minister James Moore announced last week that von Finckenstein will depart the agency when his term is up in January 2012. *But wait - there's still more change coming to the Toronto radio scene: down at the bottom of the AM dial, Rogers is again rebranding its CJCL (590), which has transitioned over the past few years from "FAN 590" to "Sportsnet Radio, the Fan 590" to the new "Sportsnet 590, the Fan." Starting this morning, the station's morning show, Brady and Lang, will also be simulcast on Sportsnet's national TV network. *Elsewhere in the province, the CRTC turned down a few applications last week, most notably one from Evanov ("Dufferin Communications") for a new high-powered FM signal on 104.7 in Muskoka Lakes. That application ran up against a wall of opposition from the other broadcasters who already serve the Muskoka region. They argued that while the Evanov entry might be the first local station licensed to the "Township of Muskoka Lakes," the area already enjoys local service from other nearby stations in Huntsville, Orillia, Parry Sound and Bracebridge, and the CRTC determined that the new station would indeed overlap with - and cut into the economic viability of - Haliburton's CFBG (100.9) in Bracebridge. The CRTC also denied a power increase for CJLF-FM-1 (90.1 Owen Sound), ruling that the religious station had failed to make a compelling economic or technical case for a boost from 75 to 780 watts. To the north, though, Le5 Communications did get approval for a power increase from 1400 to 4620 watts at CHYC (98.9 Sudbury), while way out to the northwest, CKPR-FM (91.5 Thunder Bay) has been granted a 180-watt rebroadcast transmitter that will bring its programming to Atikokan at 93.5 on the dial. *Near Montreal, a pirate station on tribal land is going legit: the CRTC has granted a license to "Kahnawake Keeps It Country Station" for a new 610-watt directional signal on 89.9. The new station, already granted the callsign CKKI, will replace the current unlicensed "KKIC" signal at 106.7 on the Mohawk reservation across the river from the big city. 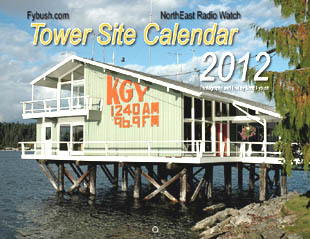 TOWER SITE CALENDAR 2012...ORDER NOW! A decade ago, it was just a goofy idea: "Hey, you should put some of those tower pictures into a calendar!" But when Tower Site Calendar 2002 appeared, it was a hit - and ten years later, the fun still hasn't stopped. And now it's that moment at least some of you have been waiting for: the release of our latest edition, Tower Site Calendar 2012, seen for the very first time right here! As befits a tenth-anniversary edition, this one's special: in addition to all the great tower photos and historic dates you've come to expect from our calendars, the new 2012 edition is our first-ever themed calendar, paying special homage to the many stations that began broadcasting during radio's first big boom year of 1922. The 2012 edition brings something else that's new to the Tower Site Calendar: the option of a spiral-bound edition that will hang flatter on your wall. The calendars are back from the printer, and the first shipments went out to early purchasers on Saturday. But don't worry: we still have plenty of both versions of the calendar (plus the signed, limited-edition version) on hand. So don't miss your chance to be part of the very first shipments...or to make your 2012 calendar order part of the subscription you'll soon need to continue enjoying all of the features of fybush.com. Order now - or subscribe - at the fybush.com Store! *One of NEW YORK state's newest radio stations may also be the next to leave the airwaves. Out on Long Island's East End, Hamptons Community Radio won a construction permit in 2008 for a share-time operation at 90.7 in East Hampton, a facility it eventually augmented with the acquisition of the former WPKM (88.7 Montauk, now WEER) from Connecticut-based WPKN. But while the Hamptons are home to some of the wealthiest people in America, it's been a challenge for broadcasters out there to convert their listenership into money. We've reported at length on the struggles Peconic Public Broadcasting has faced in converting what's now WPPB (88.3 Southampton) to local ownership, and for the folks at Hamptons Community Radio, things have been no easier. Last week, Hamptons posted an announcement on its website, saying WEER is shutting down. "We finally found a grant writer to work with but its too late. Weve tried to explain that the only way WEER could survive was with community support especially in the way of benefactors. We have been unsuccessful in getting that kind of support. We have worked hard to accomplish our mission - to that end we were succeeding. But without benefactor and down the line grant support and the support of businesses and the community WEER has to say goodbye," said the message. The station is holding out hope for a last-minute turnaround: in its farewell note, WEER says it could keep going if it can find eleven other area businesses willing to join one existing sponsor in covering the station's expenses, which include $4,000 in monthly tower rent. If WEER doesn't make it, the terms of its $60,000 purchase of the 88.7 facility (which specified payment in 60 monthly installments of $1,000 each) specify that the signal will return to WPKN, which had been using it as a Long Island relay of its main Bridgeport signal; it's not clear what would become of Hamptons' two unbuilt construction permits, the part-time WEEG (90.7 East Hampton) and WEEW (89.1 Westhampton). *In Albany, veteran PD Terry O'Donnell is gone from WFLY (92.3 Troy), with no replacement named yet. But O'Donnel's not going too far: he's headed for a new job across town at Townsquare's "Crush," WQSH (105.7 Malta), where he starts as PD next Monday, replacing the departed Mike Morgan. Down the road in Catskill, the Black United Fund of New York has filed to sell WCKL (560). The operator who's been LMA'ing the station is "Harvest Broadcast Services," run by Brian Dodge, whose adventures in New England radio were chronicled extensively in this space a decade ago, but in the filings with the FCC, the new buyer is listed as "Family Broadcasting and Media, LLC," owned 100% by one Tammy Thayer. Family is paying Black United $25,000 over four years - and "Harvest," which will continue to LMA the station, is assuming $96,000 in debt, including $80,000 in back rent to Clear Channel. Clear Channel donated WCKL to Black United in 2003, and the station was mostly silent in the years that followed until Family began its LMA earlier this year. *On TV, Jerry Barmash at FishbowlNY.com reports veteran anchor Jim Watkins is gone from the airstaff at New York's WPIX (Channel 11), where he'd been doing the weekend shows after losing his longtime spot behind the desk on the 10 PM weekday newscast. Replacing him, at least for now, is his former weekday co-anchor Kaity Tong, who'd been doing field reporting. Around the region, two new networks are making an impact on DTV subchannels. The new BounceTV network launched on Monday with the aim of serving African-American audiences, and charter affiliates included WROC-TV (8.2) here in Rochester, WTNH (8.2) in New Haven/Hartford and WMCN (44.2) in the Philadelphia market. Meanwhile, the Chicago-based MeTV network continues to sign up new affiliates, often at the expense of the faltering RTV network. New launches just this week included WHEC-TV (10.2) here in Rochester, WMUR (9.2) in Manchester, New Hampshire and WJAR (10.2) in Providence, where it displaces RTV from that subchannel. RTV has also recently disappeared from WGRZ (2.3) in Buffalo, which will also be losing its 2.2 subchannel when Universal Sports exits terrestrial DTV distribution at the end of the year. And just last week, RTV lost its low-power affiliate in New York City when it was dropped from the 42.3 subchannel on WKOB-LD (RF 2), which is now programming old public-domain movies on that stream. *It's not just Canada's CBC celebrating its 75th anniversary this year: New York City's WQXR also hits that milestone this fall, and the station's current incarnation (now at 105.9 as a noncommercial facility owned by WNYC) is marking the occasion with a special audio stream called "Vintage WQXR" featuring programming from the station's extensive archives and a website full of archival pictures and stories. *The merger of WBFO (88.7) into its former Buffalo public broadcasting rival, WNED, is nearing completion. Tomorrow night, WNED officials will hold a public forum at their downtown studios to discuss their programming plans with listeners. The session starts at 6, and WNED is asking prospective attendees to RSVP because of limited seating. Those same WNED studios are the location each fall of the Buffalo Broadcasters Association's annual Hall of Fame induction, and now the group is adding a second annual awards ceremony. While the Hall of Fame ceremony is meant to honor the veterans who made the largest impact on the city's media scene over the course of their careers, the new "Buffalo Excellence in Media Awards," or "BEMA," are intended to recognize the people and stations still active in the business. The initial crop of BEMAs will be handed out April 13, 2012 at a ceremony to be held at Salvatore's Italian Gardens in Depew, and they'll include categories such as "digital media outlet of the year, "rising star," "backpack journalist of the year" and "best use of social media." Nominations are being taken through October 30 at the BBA website. *One of the BBA's previous Hall of Fame inductees has died. Iney Wallens was a fixture on the Niagara Falls radio scene back in the days when there was a Niagara Falls radio scene, hosting a talk show on WJJL (1440) that ran for decades before winding down in 2008. Wallens was honored with a Distinguished Broadcasters Award from the BBA in 1998; she died on Sunday. *And here's another reminder about a great opportunity to come see your editor in person: at booth D14 on Wednesday at the SBE22 Broadcast & Technology Expo at the Turning Stone Casino & Resort in Verona, just off the Thruway between Syracuse and Utica. *There's a format change in southern RHODE ISLAND: Judson Group-owned WCNX (1180 Hope Valley) is dropping its news-talk format to become WCRI, a daytime-only AM simulcast of sister FM classical station WCRI-FM (95.9 Block Island). *After the cutbacks at Cox Radio's southern CONNECTICUT cluster, there's a promotion: Jolana Smith moves from weekends to middays at WEZN-FM (Star 99.9) and assistant PD for that station and sister stations WPLR and WFOX. Speaking of Hanover and vicinity, James McKay is the new general manager/general sales manager at Bob Vinikoor's WNTK (99.7 New London)/WUVR (1490 Lebanon), where he's been doing the morning show alongside John Harper since April. And in Concord, Harry Kozlowski's new WCNH (91.5 Bow) signal is on the air; it will soon replace the classical station's old LPFM home at 94.7, which is now known as WNHN-LP and will be transferred to a local group that will program a "news and blues" format at that frequency. The new lineup gives morning host Laura Carlo an extra hour, extending her show to 10 AM, followed by Alan McLellan at 10 and Cathy Fuller at 2. Former afternoon host Brian McCreath moves to weekends-only with his "Bach Hour"; in the evenings, the "Classical New England" schedule now includes "Performance Today" at 7 and a new live, local host from 9 PM until midnight, James David Jacobs. The station has made one more addition, too: Cheryl Willoughby joins WGBH from Vermont Public Radio to serve as classical music director. *There's a new news director at Springfield's WGGB (Channel 40/"Fox 6"), where Jim Tortora lands after a decade at WSYR-TV in Syracuse; Tortora's move completes a western-Massachusetts-for-upstate-New-York shuffle that found previous WGGB news director David Baer moving west to WXXA in Albany. *There's a slew of new callsigns for all those construction permits the FCC recently issued: Horizon Christian Fellowship's new stations around the region will be WJXP (90.1 Fitchburg MA), WTYN (91.7 Lunenburg MA), WYZX (88.3 East Falmouth MA), WYDI (90.5 Derry NH) and WXEV (91.1 Bradford RI). And mark down WNNI (98.9 Adams MA) for the new relay of WFCR's secondary public radio service out in the Berkshires; that call was issued a month ago but slipped past us until the FCC put out a new "callsign change report" last week. Speaking of late renewals, the Atlantic City, NEW JERSEY public schools station, WAJM (88.9), is edging back into the FCC's good graces. Its failure to file a renewal application in the 2005 cycle came to light last month when two other Jersey Shore stations, WZBZ (99.3 Pleasantville) and WBHX (99.7 Tuckerton), filed to swap frequencies, a move that's possible only if WAJM is deleted. Rather than fade away, though, WAJM quickly filed both for renewal and for Special Temporary Authority to continue operating, explaining that "the licensee deeply regrets these errors," which it says were "the result of an administrative oversight that the licensee is taking immediate steps to correct." If WAJM's license renewal is indeed granted, it may not mean the end of the WZBZ/WBHX swap and of WBHX's plans to improve its signal. The WBHX application noted that stations of 99 watts or less aren't subject to the IF-spacing rules that would block WZBZ's move to 99.7, and WBHX owner Press offered to pay for WAJM to downgrade slightly from its present 150 watts to 99 watts. In a quiet week in PENNSYLVANIA, our biggest story comes from just outside Pittsburgh, WAVL (910 Apollo) has dropped its contemporary Christian format ("Praise 910") in favor of a conservative talk lineup as "Liberty 910." The new schedule there includes Bill Bennett's "Morning in America," Neal Boortz, Dave Ramsey, Clark Howard and John Batchelor. Friday was launch day for the newest FM station in CANADA's Maritimes. Evanov's CKHY (105.1) launched, appropriately enough, at 1:05 PM on October 1, counting down the "top 105" modern rock songs selected by its listeners-to-be. "Live 105" also unveiled its jock lineup that starts today: Cub Carson (formerly of Virgin 106.9 in Ottawa) and Floyd (late of Saskatoon) kick it off at 5:30 with "The Morning Mob"; they're followed by Christina (from Corner Brook, Newfoundland) in middays, Scotty Mars (who moves over from Q104 in Halifax) in afternoons and AJ (who'd been at Edge 102 in Toronto and more recently at Live's sister station Z103 in Halifax) at night. There's a new broadcaster coming to the TV dials in MASSACHUSETTS and CONNECTICUT. Arthur Liu, whose Multicultural Radio Broadcasting has become a major force in leased-time radio in big cities from Boston to New York to Los Angeles, is entering the television arena with the $170 million purchase of Shop at Home TV's five UHF stations from Scripps Howard. Liu is creating a new company, Multicultural Television Broadcasting, to operate the stations. Four of the five, including WMFP (Channel 62) in Lawrence, Mass. and WSAH (Channel 43) in Bridgeport, Conn., were full-time outlets of the former Shop at Home TV network, which Scripps also recently sold. Since that sale, they've continued to broadcast the network under its new owner, Jewelry Television. That will surely change under Multicultural, whose model for TV will likely follow the company's successful radio model, under which all or nearly all of its stations' airtime is leased out to program producers, mostly in foreign languages or serving ethnic audiences. For WMFP, which transmits from One Beacon Street in Boston and has nearly full-market cable carriage, that shouldn't be difficult. For WSAH, it will be a bit more of a challenge - while the station is technically in the New York City TV market, it has little cable carriage beyond Connecticut and no over-the-air presence in the city itself. Given its distance from the center of the market, and its history of non-carriage on New York and New Jersey cable systems, it may face a challenge in getting on cable in those areas, which would impair its reach. In other news from the Bay State, Jay Severin returned to his former radio home Monday, as the cancellation of his Westwood One syndicated evening offering freed him to return to the 3-6 PM slot on flagship WTKK (96.9 Boston). The move once again puts Severin head-to-head against Howie Carr on WRKO (680), and it pushes Michael Graham from WTKK's afternoon drive slot to evenings. Severin also says he's moving from Sag Harbor, N.Y. (where he's been doing the show via ISDN since its Boston-only days at WTKK) up to the Boston area soon. It's not often that we start a NERW report in NEW JERSEY, but this week, that's where the big story seems to be. To be precise, it's in Bridgeton, way down at the southern end of the Garden State, where aficionados of quirky local radio have long prized WSNJ (107.7/1240) as an exemplary specimen of the kind of full-service station that disappeared most places years ago. Under the ownership of Ed Bold, WSNJ today sounds pretty much the same way it did a couple of decades ago - everything from lost-dog announcements to school menus, with a few songs here and there, a top-hour ID that still proudly proclaims that the FM signal is "in stereo," and a midnight signoff. But at the age of 82, Bold has decided to retire, and that means WSNJ has been sold. The Bridgeton News reported Thursday that Bold will receive $20 million for the station, including its real estate and prominent self-supporting tower, from an unidentified buyer "from South Carolina." That, in turn, immediatedly prompted speculation involving the Beasley family, which owns a Philadelphia cluster that includes WXTU (92.5) and WPTP (96.5) - though we'd be quick to note that Beasley Broadcasting is currently headquartered in south Florida. We'll be following this one closely in the weeks to come. In CONNECTICUT, WGCH (1490 Greenwich) is trying to stay on the air in the face of an eviction notice. The little community station has known for two years that it will have to abandon its tower at 175 W. Putman Ave., a move it's wanted to make anyway, since new construction has blocked much of the signal from that aging facility. Now it appears WGCH's landlord has run out of patience, leading to a September 17 notice to vacate the site and remove the tower. WGCH's latest plan for a new site, in the face of what its owner calls the "severe, almost draconian zoning regulations" in Greenwich, involve the parking lot of the Cos Cob Marina on River Road, about two miles from the present site. WGCH has asked the FCC to move quickly on approving the use of a very short Valcom fiberglass whip antenna, a type only approved until now for daytimers (the first one being WSHP 1480 in Shippensburg, Pennsylvania). We'll keep you posted on WGCH's status as the eviction notice works its way through the system; we believe the station remains on the air for now. The Fox that Growled: NERW was quite surprised during its trip up to Bangor, Maine a week and a half ago, when a quick check of classic rock WWFX (104.7 Belfast-Bangor ME) turned up country music instead. It seems the "Fox" has undergone a species-change operation, emerging on September 20th as "the Bear," playing "hot new country." This sets up not a cross-town rivalry, but an across-the-street rivalry with longtime Bangor country leader WQCB (106.5 Brewer-Bangor ME). Q106's studios are just half a block down Acme Road from WWFX in Brewer, Maine. The nice folks at WWFX weren't saying, but NERW suspects a call change is in the offing there. NERW editorial comment: The move to country is probably a sound one. WQCB has been without competition since 97.1 Bangor changed from country WYOU to modern-rock WWBX ("97X") a year or so ago. And between 97X and rocker WKIT, the rock wars were getting a bit heated in Eastern Maine. The WMEX calls that are a part of Boston's radio heritage have resurfaced, this time in Westport NY on the 102.5 construction permit last known as WADQ. Westport is across Lake Champlain from the already overbuilt Burlington, Vermont market. WMEX's last home, 1150 AM in Boston, is now WROR(AM) and will reportedly switch to the KidStar format sometime next week. WROR's sister station, WBCS 96.9 Boston, has now officially switched to the WKLB-FM calls adopted from what's now WROR-FM (105.7 Framingham-Boston), although 96.9 continues to mis-ID as simply "WKLB Boston." Up in Vermont, WCMD (89.9) in Barre is now on the air, simulcasting religious WCMK (91.7) in Bolton. The 90.5 construction permit in St. Johnsbury, granted as WAQA, has filed to change to WCKJ. This will reportedly be another religious outlet. Not too far away, in Keene NH, WKNE AM/FM (1290/103.7) have reportedly been sold for a total of $6 million...more on this next issue.